Anson Call with images from his e-textbook. Larger image. Photo by Bob Elbert. AMES, Iowa -- Anson Call didn't want his Iowa State University design students paying nearly $300 for instructional materials that would be out of date in a matter of months. Nor did he want to negotiate with publishers to write the book they wanted, which could be out of date by the time it was printed. 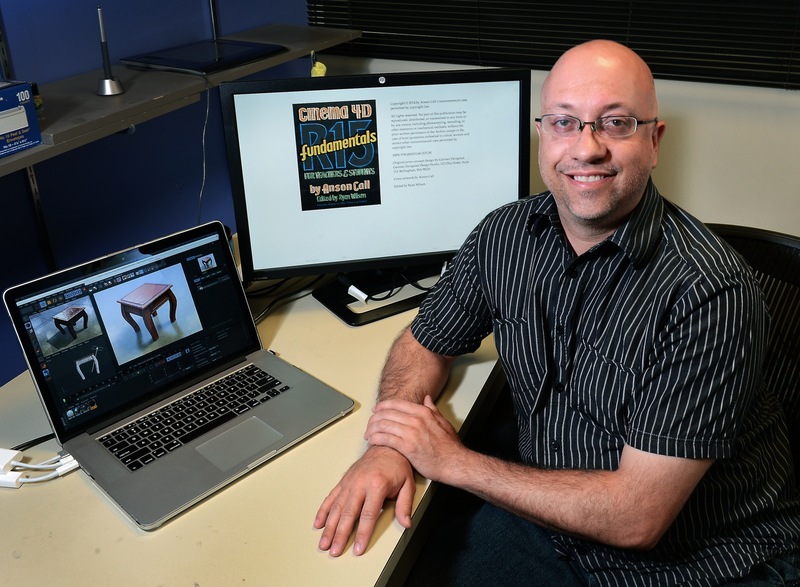 So, when Call, an associate professor of graphic design, wrote his textbook on using industry-standard software to create 3-D modeling and animation, he did it digitally. His e-textbook, "Cinema 4D R15 Fundamentals for Teachers and Students" is available at amazon.com, barnesandnoble.com and elsewhere for $17.99. That’s about $282 less than the alternative. And whenever the software gets an update, Call can adapt all the relevant content in his e-textbook and refresh all of the online tutorials. His students will always be learning the current iteration. "I created this with students in mind," Call said. Final tutorial composition. Image by Anson Call. Targeted for beginners, Call's book teaches the basics of Cinema 4D, a "vast application" for 3-D modeling, texturing, lighting, rendering and animation. All design disciplines are apt to use those tools for one purpose or another throughout their careers. "An architect could use these tools do a plan, an industrial designer to design a new product, an interior designer to visualize a space, a graphic designer to do motion graphics, a game maker to generate a character or an artist to create a work of art," he said. Call describes his e-textbook as "half a book and half video instruction" because it includes seven hours of video. He wrote all of the text, created the images and videos. All of the material was reviewed by qualified faculty. "The interesting thing about e-books, is that there's no formatting needed. The e-reader overrides any formatting," he said. "As a designer, it's a little unnerving to not have control over the visual design. But it's actually quite liberating to give that stuff up. You're designing a free-flowing experience." And it's much quicker for the author to do a thorough revision of the e-book's content. "If the new release of the software changes the menus, a technique or a feature that impacts the basic fundamentals of Cinema 4D, that instruction will get updated in my book," he said. "Other instruction usually just adds new sections or videos to cover the new menus or features. They don't always show how the updates affect the fundamentals." Created using software taught in Call's e-textbook. Image by Anson Call. Call, who joined the ISU College of Design faculty in 2003, was hired specifically for his expertise in 3-D modeling and animation. He had worked with the technology since 1996 as an undergraduate and graduate student at Utah State University. "I taught myself a lot of this. It was before the days that the Internet became a valuable learning tool for this kind of content, so it was very challenging to learn the content," he said. "I can relate to what students go through today, which helped me with creating tutorials and writing this book." Most of the students Call teaches are in their third or fourth year in the design college. Some come from the engineering disciplines and a few from the liberal arts and sciences. "Some fall in love with 3-D and take the courses that follow -- in motion graphics or scientific visualization," he said. "Other students really struggle with working with 3-D on a flat screen. It's a real disconnect for them, so they have a hard time manipulating things virtually." Many of Call's best students are hired as undergraduates to work on campus at ISU's Virtual Reality Applications Center. Others go into game design, motion graphics, film, engineering design disciplines and academia. Anson Call didn't want his design students paying nearly $300 for instructional materials that would be out of date in a matter of months. So the associate professor of graphic design wrote his textbook on using industry-standard software to create 3-D modeling and animation, he did it digitally. His students pay less and will always be learning the software's current iteration. "I created this with students in mind." Texturing, no lighting. Image by Anson Call. Textured 3-D stool with lighting. Image by Anson Call.